Peter Elliott: Is it safe? Dr. Adam Royston: Unfortunately yes. The plot: In the remote Scottish Highlands, a living radioactive mass seethes out of the depths of the earth and kills everyone in its path as it seeks fresh radioactive energy. Luckily an American scientist is about the place and kicks the 'thing' back down from whence it came. 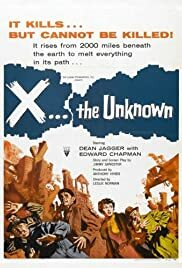 X the Unknown, while not having the innate intelligence of the Quatermass movies, is a good example of 1950's British pulp science-fiction cinema. While most of its American counterparts visited fantastic worlds inhabited by outlandish monsters and gorgeous 'space-babes', X the Unknown was a truly British effort: our monster was dollop of mud out of a hole in the ground doing a slow crawl around a dingy moor. It's effective though. It has the same austere, grim intensity which made the Quatermass movies so memorable. 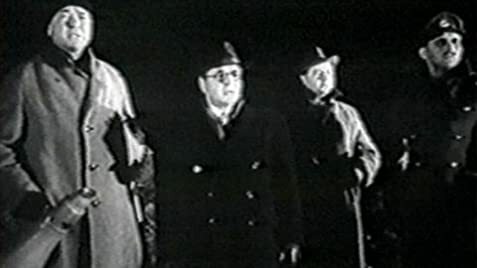 The film also benefits from moody, high-contrast black and white photography, a typically acerbic score from James Bernard, and a good cast; Leo Mckern turns in a very good, naturalistic performance, much like his turn in The Day The Earth Caught Fire. I first saw this movie when I was about six and the extraordinarily graphic scene depicting the monster 'devouring' a hospital doctor gave me a few... err....sleepless nights (there's a particularly ruthless zoom-in to the poor guys hand as it expands and melts!). Perhaps I should have stuck to Bugs Bunny. Overall, a decent chiller, well directed by Leslie Norman (late father of the superb British film critic Barry Norman). One last memory of a six year-old's first viewing of this picture: I remember sitting there stunned and horrified as the end credits rolled; I was not looking forward to a good nights sleep. The statutorily paternal BBC announcer came on and cracked the following nervous joke: "Well, I'll never eat cheese on toast again" (see the film and you'll know what he meant). I laughed with relief and my childhood was thus saved a terrible trauma! Thanks Uncle Beeb. 35 of 37 people found this review helpful. Was this review helpful to you?